A Guided Self-Care Journal Made Just for You! Track your progress in your self-care journey and pinpoint the exercises that make you feel the most refreshed, rejuvenated, and ready to face the world in this beautiful and inspirational guided journal. Self-care is an essential part of wellness. But as your state of mind can vary from day to day and season to season, it can be difficult to find and remember the self-care practices that were most effective. Choose You gives you a space to record your routines and easily identify which worked best for you, so you can nurture yourself and navigate the chaos of daily life. 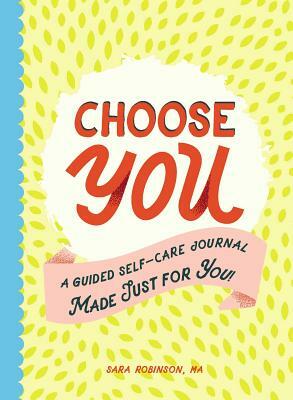 Choose You contains more than 150 pages for guided journaling, including questions for reflection, useful tips, inspirational quotes, and fun ideas for self-care activities. Additionally, you’ll become an expert in the “what”s and “why”s of self-care, and learn strategies to effortlessly integrate these routines into your everyday life. Whether you’re new to the world of self-care, or you’ve been perfecting your methods for years, Choose You is the perfect companion for achieving total mind and body wellness! For the last decade, as a Mental Skills Coach, Sara Robinson has helped individuals change the way they think and feel to create positive behavioral changes. Sara regularly speaks about the importance of balance and self-care and has been a guest on the SuperMum podcast and The Mom Inspired Show and a speaker for the Mom Project Summit 2017. Her blog, Get Mom Balanced (GetMomBalanced.com), aims to support busy working moms to find balance and time for self-care and helps moms develop the mental skills that they need to thrive. She’s a regular contributor to RunSmart Online and the LPGA Women’s Network blog. Sara has a master’s degree in sport psychology. "This gorgeous guided self-care journal will help you be your best self. Through various exercises, you’ll go through self-reflection that will help you emerge as a more polished version of yourself." "In Choose You, Robinson includes a variety of insightful quotes and helpful ideas for making self-care a reality in our days."